After much thought and deliberation, pondering, thinking, and praying earnestly, I've decided that I need to give up scrapbooking. As much as I love having our precious memories preserved through this unique and joyful artform, it has simply become too time consuming, expensive, and it's taking over our house. I'm boxing everything up and selling it before our big move. I'm going to miss all the wonderful friends I've made and the therapy it provides, and hopefully in the future I can start up again. So. That's that. Although I am purging 90% of my supplies and only keeping "current" product. I call it "The Great Purge of 2013". HAHA!!! Love it!! I was fooled for a second, but then thought No Way! LOL! I saw the title of your post ion my blog feed and was like "WHAT"?????? You got me!!! :). LOL - Yep, you got me. I did go into shock a bit, but was gullible enough to believe you! you totally had me! hehehe! I was about to call you and try to talk you out of making this tragic mistake!! You got me! You little trickster, you! For a split second, I thought about your move across the big pond and everything else you have going on but then it clicked. It would take more than that to keep you away from scrapbooking and there'd definitely be an uprising from all of us!!! Too funny. I knew it! 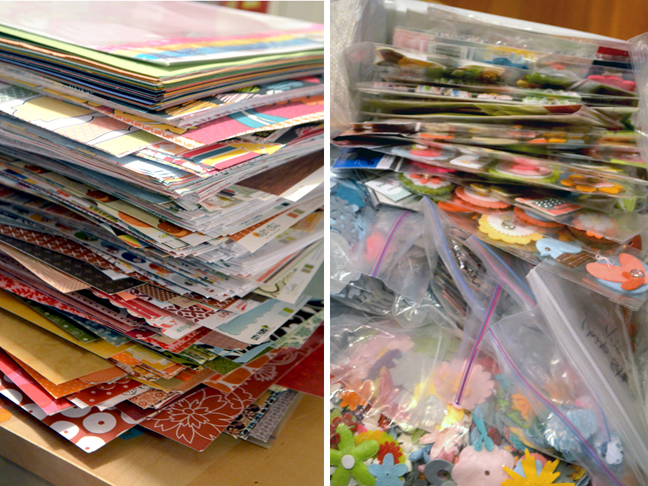 Drooling over your collection of Thickers, and all of your stacks of fun crafty stuff! My heart stopped for a second... and then I remembered what day it was. Ha! You totally got me. First it was shock, then it was...well they are moving. Then I figured it has to be so time-consuming to do those beautiful pages. Finally, I was like...I would love to buy some of that stash. Yep, you totally got me. omg, you totally fooled me. i was so sad because you offer so much inspiration. You got me. I was freakin' out. What would I do without inspiration from you?! You got me! It made sense because of your move but at the same time I was sad for you! Great joke! Omg, Paige. Don't ever do that again!! Lol, totally fooled me! I knew it before I even started. I'm on to you Taylor-Evans! ha! I knew it too--but GOOD for you on the purge, how liberating!